Which one would win the nobel first? We watch their so-called "fiendish" schemes being defeated on a regular basis, but have you ever stopped to wonder whether life would be better if the bad guy won? Here're some villains we're rooting for... and why we're doing so. The Fantastic Four's first villain, the Mole Man's modus operandi switched up from attacking humanity because they weren't monsters to one of ecological conservation, trying to get humanity to leave Monster Island alone and stop bringing the monsters therein to the brink to extinction. Who can't get behind that? He's like a shorter, uglier Al Gore who just happens to command an army of near-unstoppable genetic accidents. If we just let him win, who knows what kind of era of ecological paradise we could be letting ourselves in for? The second Reverse-Flash, Hunter Zolomon was a former police criminal psychologist who became unstuck in time and mind after an accident involving the Flash's Cosmic Treadmill. Obsessed with making heroes "better" by forcing personal tragedies on them so that they'll try harder, he's the poster boy for tough love... But he really is trying to make the world a better place, albeit in a twisted manner. Instead of beating him up for that, why not try and just convince him to soften his methods and let him run free? What's the worst that could happen? Well, besides him trying to kill your family as motivation, of course. All he wants to do is end genetic persecution! Is that really so wrong? Sure, you can argue with his ways of going about it - I don't think anyone here would be fully supportive of his controversial "enslave and destroy the human race" agenda - but the man's lived through Nazi concentration camps, been acquitted by an international court of evildoing and, if nothing else, is fully dedicated to his beliefs. 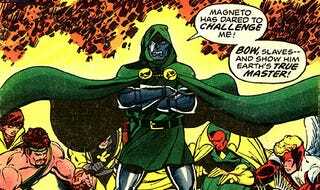 Is there really any proof that a world controlled by Magneto wouldn't be one less filled with hate? We don't think so... even if it's because most of us would be dead. Those unconvinced of Victor Von Doom's leadership potential need only look to his kingdom of Latveria for the proof: Crime is nearly non-existent! Illness equally so! And the people love their leader (Admittedly, because to admit otherwise may result in death, but still: Details, people). Sure, evidence also points to our having to put up with a merciless police force of Doombots and having to dress and act like Eastern European villagers from the late 19th century, but aren't those prices we're willing to pay for a reduction in crime and illness? Admit it: Maybe we could all benefit from being ruled by an iron (clad) hand or two. Last year's Final Crisis showed a world under self-styled Ultimate God of Evil Darkseid's will-sapping regime, and aside from the complete absence of free will and slow devolution of the planet into a red-skied radioactive wasteland patrolled by mutated dogs and men with tiger heads, we can't help but notice that those submitting to the Anti-Life Equation seemed much less in emotional turmoil or upset about the direction that their lives had taken - In fact, they seemed confident and assured, unlike those who'd chosen to resist. And, yes; those who resisted eventually assisted in the recreation of existence itself, but still. Isn't having even will-sapped piece of mind about your place in the world worth some sacrifice? Here's one we know works from experience. Futuristic hypnotist Universo managed to hoodwink the entire planet under his command in the 1987 Legion of Super-Heroes storyline "The Universo Project," and the result was a peaceful planet where superheroes weren't needed at all. Easily the best case scenario we've seen, it didn't even involve Darkseid-esque worldwide mind control - Only figures of authority (and some superheroes) were hypnotized, meaning that the common man and woman would happily have freedom to toil and work for The Man as usual, without knowing that it was a different The Man all along. Win win!